I’ve been very excited about a recent project, a fund-raiser for TASH, for a few reasons. It gave me a chance to work with some of the new information I’ve been learning about online training; I got to work with some people I really like, who were excited about a topic that excites me; I got to use LOTS of graphics in my parts of the webinars, and I got to “give back” to TASH, which has been so important player in my own development. At Spectrum We give TASH a lot of credit for what we’ve done well. Here is more information about the seven part “Dancing with Community” webinar series, which will be available for at least the next month or two. I think these are really worthwhile and am particularly excited about some great new voices who were involved in this production, as well as some more experienced folks who just jumped right in and helped out so graciously. 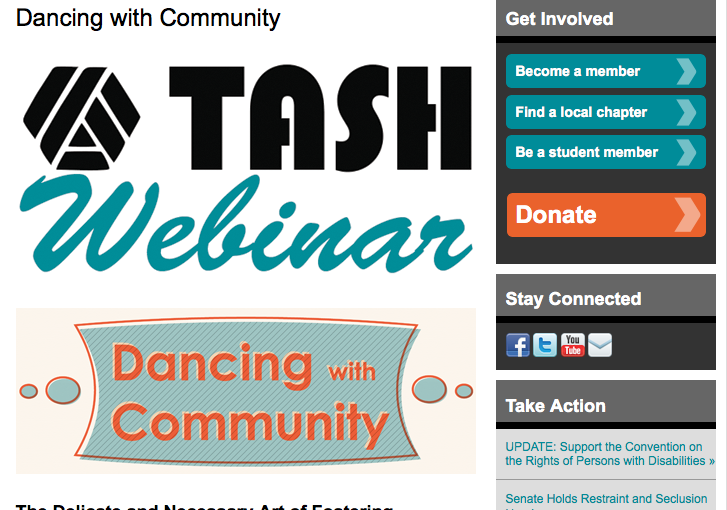 Dancing with Community is a seven-part webinar series that digs deep into relationship building and community inclusion for people with disabilities. In each session, come along for a unique journey of support that focuses on stepping into the role of a community citizen, and out of the role of agency client. We’ll get to know and understand each aspect of the “dance,” from taking the first steps onto the stage of community, to finding the right dance partners and learning the moves! All sessions are pre-recorded and available 24/7 for convenient access. Participate in each session as many times as you like! Why is it harder for people with disabilities to form lasting and reciprocal relationships with friends, coworkers, family members and neighbors? Or is it harder? And why are relationships so important anyway? These are the questions we’ll explore during this introduction to the Dancing with Community webinar series. Join us for a look at some of the findings from the Spectrum Society’s research, training and development division, which has been examining these questions with people with disabilities, families, staff, researchers and others for years. This session will cover what we know and what we might learn from each other, including those who have been tackling this issue with great success! Aaron is a proud parent and longtime foster parent to children with disabilities, as well as a service provider, consultant, workshop leader and graphic facilitator. He is the co-author of two books, 101 Ways to Make Friends: Ideas and Conversation Starters for People with Disabilities and their Supporters, and the companion volume, 101 Ways to Facilitate Making Friends: How to Engage and Deepen Support Networks for People with Disabilities. Aaron is also the author of Renegotiating Reciprocity: Supporting Children and Adults with Disabilities in our Families, Networks and Communities. A popular workshop leader, he and colleague Susan Stanfield have conducted more than 90 sessions with self-advocates, families, supporters and professionals on support networks, community based instruction, changing roles in agencies and other topics. Aaron and Susan, along with Shelley Nessman, are working with groups of self-advocate researchers to translate government documents into plain language and graphics. Learn more at the Spectrum Society’s Research Training and Development division at http://www.101friends.ca or see their products at http://www.spectrumpress.com. There is a road from the eye to the heart that does not go through the intellect, so says G.K. Chesterton. In this session we will take that road to explore the meaning of community engagement. Why is connection so important for people? How do we recognize the impulse to connect and act upon it in ways that support people to be connected with people other than us? We will begin with the only tangible source of knowledge any of us have –our experience, our imagination and our shared humanity. Sally has worked in the field of developmental disabilities for more than 27 years. She has worked as direct support staff, manager and coordinator of services in a residential setting; provided organizational development, staff training, conflict resolution to agencies and boards wishing to promote person-centered values; facilitated circles of support and person-centered planning for people with disabilities and their families; presented at conferences in the U.S. and Canada; co-facilitated a People First chapter; authored a chapter in Implementing Person Centered Planning; mediated multi-party conflicts for DDD; served as a Personal Agent for people in employment services; and is currently the coordinator of employee development at Total Living Concept. She has a Bachelor’s degree in Dance and German, and is a certified mediator. Our world will be a better place when everyone has access to opportunities common to all. It’s natural to belong! You can be an exceptional guide for any individual you support as you dance through the community together. With your eyes open and attention focused on a few important tools, you’ll find great resources and opportunities at your fingertips! In this webinar we’ll learn to identify interests and discover new interests by following threads; find community treasures and resources in plain sight, as well as dig for hidden resources in familiar places; detect where and how the person you are supporting can participate and contribute with others who share their interests; cultivate strategies for successful involvement and troubleshoot those situations that don’t turn out as planned. Join us as we share, teach, uncover and rediscover resources and strategies that you can use to find involvement opportunities that best match the person’s interests with whom you’re working! Keri has worked as a community guide for Total Living Concept since 2003. In that role she helps isolated individuals with developmental disabilities connect to their communities in many different ways. While at Total Living Concept, Keri has gained experience in job coaching and development, and has been a presenter at TASH conferences throughout the country. In her free time, Keri enjoys reading, spending time with her dogs Capt. Rusty and Meatwad, and roller derby. This webinar session examines what it’s like to step out of center-based practices and into letting a community partner take the lead steps of dancing with the people you care about. We’ll explore how a group of people can find suitable partners and start the dance of community acceptance. How do you let a partner hold the story and work through the challenges? What will other partners think when they see you dancing on the stage of community? In this session we’ll look at real examples from the Spectrum Society to see what happens when regular communities become the home-base for people, and the moves to get on the dance floor of community! Jules helps to network for people who have experienced profound disabilities, including finding ways community can have reciprocal relations with people we care about. Jules has contributed in a series of roles with Spectrum Society for Community Living in Vancouver, Canada. He currently serves as the bridge between networks and communities to get involved in the lives of people. Over the last year Jules has focused on helping people experience travel internationally to Long, Paris and the United States, and supported people to be included in modern online experiences. Jules currently contributes to a variety of local and international projects and research, and has recently joined the TASH Community Living committee. In this webinar session we’ll examine the change in staff role that is necessary in order for people to be seen as a true citizen and member of their community, and not as a client of a system. By helping staff to better understand their new role, we can welcome a community in true relationship with the person they are supporting. By growing natural relationships, staff in support roles can help a person to feel better connected to the community in which they live. Pat has been the executive director of Onodaga Community Living for more than 20 years. When she first came to the agency it provided group living services. Over time the agency has transitioned under her leadership to one that provides personalized supports in living arrangements, with attention to employment, volunteerism and educational pursuits. All services are in the community and the agency has no structured services or programs; rather, each service is individually designed to match each person. Because OCL is community oriented it has worked to ensure that unpaid people be welcomed and a part of people’s lives. The mindset of staff also had to transition with this change of service. Pat is the co-author of a book, One Person at a Time and is currently working on two others books on organizational change. She is frequently asked to present on personalized support, organizational change and life sharing amongst other topics and has frequently presented in Australia, New Zealand, Canada, Ireland and the US. Michael Kendrick, Kendrick Consulting Intl. When the idea of friends and allies is formalized into a “support circle” what exactly do we mean? In this webinar we look for a more precise definition of what we might hope to create, facilitate and foster, and then examine recent experiences of successes and failures of this model. The sharing of gifts in such an arrangement is almost limitless and reciprocal, but there are many challenges as support circles tackle issues around decision-making and purpose. Participants in this webinar will learn more about methods of forming a support circle, problem-solving during difficulties, staying on purpose in terms of the individual at the heart of the circle, and celebrating successes. Michael is known internationally for his work on service quality, leadership, the creation of safeguards for vulnerable persons, social integration, change, innovation, values, advocacy, the role of individual persons and small groups in creating advances, evaluation, alternatives to bureaucracy, personalized approaches to supporting people and reform in the human service field. He has worked in the disability, mental health and aged care fields for nearly 30 years. Michael is the author of Letting in the Light: Reflections on Leadership, Ethics and Human Services. He’s also the founder of a consulting firm, Kendrick Consulting International, focused on leadership and emerging developments in the fields of disability, mental health and aging. The firm undertakes work with governments, non-government organizations and many grassroots initiatives devoted to the needs, issues and rights of disadvantaged people. For more information about Michael Kendrick see http://www.kendrickconsulting.org. So You Think You Can Dance? Taking Your Show on the Road: A Summary and Call to Action! This webinar will both summarize and expand on the topics covered in each webinar in this series. We’ll focus on action, engagement and new ways of looking at leadership. We’ll also seek to answer challenging questions. How do we help one person build a plan to deepen and expand their network? What can one person do to help? How can we keep these conversations going in our circles, workplaces and communities? Join us for this series finale.